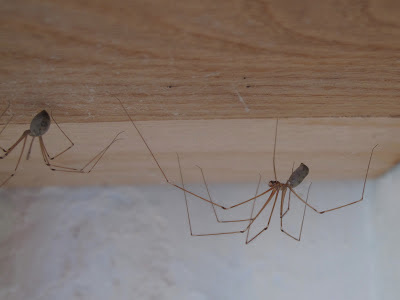 In the last few days, I have been keeping an eye on a pair of Pholcus phalangioides in my outside toilet. They are a male and a female, and given that both appear to be adults I guess the male is waiting for the female to become receptive. I got a close up of the male, showing its almost circular caparace and its palps (above). Pholcus phalangioides. Male on the right, not its elongated abdomen. 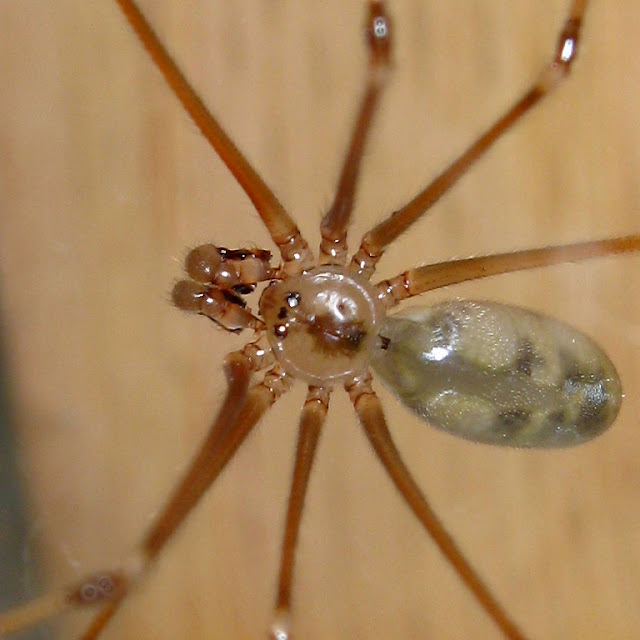 Africa, I just took these photos http://www.nanoversed.com/blog/pholcus-phalangioides yesterday before I saw your post! I can't wait to find out if yours have an egg sac soon. I like spiders but can't help feeling a bit creeped out with the likeness of a skull on these. Hi Dan, they are much more apparent now after their winder rest. My outside toiled population produces eggs every year. Yours looks like it might be a subadult male.